The Formation of English Common Law provides a comprehensive overview of the development of early English law, one of the classic subjects of medieval history. This much expanded second edition spans the centuries from King Alfred to Magna Carta, abandoning the traditional but restrictive break at the Norman Conquest. Within a strong interpretative framework, it also integrates legal developments with wider changes in the thought, society, and politics of the time. Rather than simply tracing elements of the common law back to their Anglo-Saxon, Norman or other origins, John Hudson examines and analyses the emergence of the common law from the interaction of various elements that developed over time, such as the powerful royal government inherited from Anglo-Saxon England and land holding customs arising from the Norman Conquest. 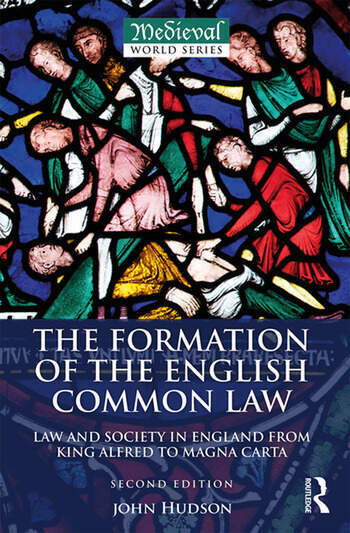 Containing a new chapter charting the Anglo-Saxon period, as well as a fully revised Further Reading section, this new edition is an authoritative yet highly accessible introduction to the formation of the English common law and is ideal for students of history and law. John Hudson is Professor of Legal History at St Andrews University, UK, and William W. Cook Global Law Professor at the University of Michigan. His previous publications include F. W. Maitland and the Englishness of English Law (2008), The Oxford History of the Laws of England, Volume II 871-1216 (2012) and Papers Preparatory to the Making of English Law: King Alfred to the Twelfth Century, Volume II: From God's Law to Common Law, ed., with Stephen Baxter (2014).